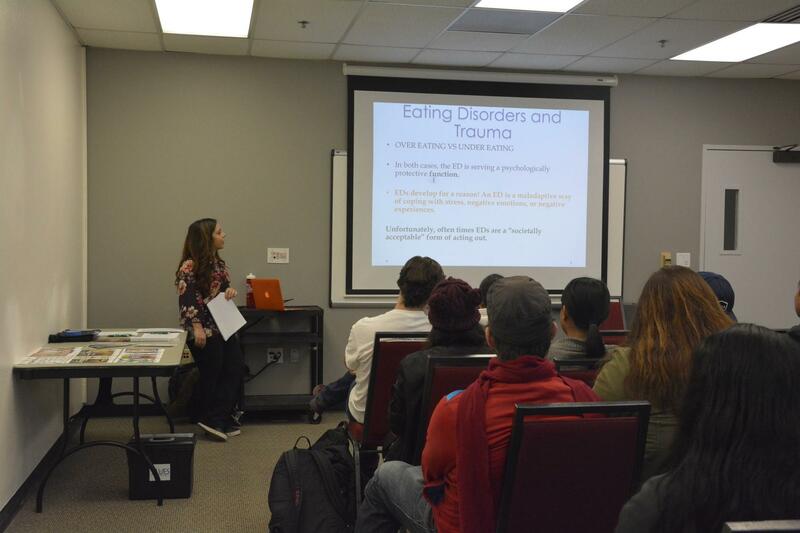 CSUN students learned about trauma and eating disorders through the “Coping with Trauma: Hope Through Understanding” workshop sponsored by Joint Advocates on Disordered Eating (JADE), which featured Paria Zandi, Marriage and Family Therapist interns and Campus Care advocates, on Monday afternoon. “[The workshop] is part of NEDA week, which is next week, but we scheduled [workshops] earlier this week,” said Angie Aguilar, JADE graduate assistant. As part of National Eating Disorders Awareness Week (NEDAW), JADE, a peer education program, invited the CSUN community to learn about body image concerns and issues individuals face when it comes to their health. According to Zandi, an eating disorder has more than one classification. “Although someone can have a healthy body weight, they could also have an unhealthy eating habit,” Zandi said. If a person shares their traumatic experience with a positive support group, they are less likely to develop an unhealthy way of coping, according to Zandi. Whereas a non-supportive response, such as “blaming or telling the victim to get over it,” as Zandi mentioned, can influence a victim’s unhealthy way of coping. If a student is going through a traumatic event that may affect their studies, they can seek help through University Counseling Services or receive consultation from Zandi. Joining support groups on campus such as Body Positive can help students start a dialogue on body image. Breathing focus and relaxation training. Orient to the immediate, external environment. For more information on NEDAW events, students can visit the CSUN Counseling Services site.